Physical attributes. With the projector on a table, all connectors are on the right side panel as viewed from behind. The power connector is near the back of the right side. A Kensington lock slot is next to it a little towards the front, along with a slot for threading a security cable. The intake vent is on the front panel, and the exhaust vent covers the entire back panel. Low Brightness Mode. Compared with Normal mode, Quiet 1 measures 75% as bright and Quiet 2 measures 58% as bright. In addition, Adjust mode allows brightness settings anywhere on a scale from 100 to 20 in steps of 0.5. The settings map roughly to percentages of full brightness, with a 50.0 setting actually 54% of the full brightness measurement. Quiet 2 also lowers rated noise to only 29 dB from the 36 dB in Normal and 32 dB in Quiet 1. Presentation Optimized Lumens. All of the color presets deliver vibrant color for business graphics, so there's no need to choose between image brightness and eye-catching color. At 6,296 ANSI lumens, Dynamic mode can easily light up a 230-inch diagonal 1.0-gain screen in moderate ambient light. With default settings, Dynamic has an ever-so-slight red bias that was obvious in only one photo in our test suite. Dropping the Red Gain control by a hair solved the problem with no loss in brightness. If you don't need the WUX7000Z's full brightness, you can use one of the Quiet modes, the Adjust mode, or a lower-brightness color mode. Video Optimized Lumens. Dynamic also delivers the best combination of brightness and image quality for film and video. For best color accuracy, the 6-axis color controls--with hue, saturation, and brightness adjustments for each color--makes it easy to get a close match to a reference image with no loss of brightness. You can also turn on one or more of the Memory Color correction options--Flesh, Sky, and Green--and set each independently to Weak, Middle, or Strong. We turned on the Flesh correction for our tests, again with no loss of brightness. We didn't see any need for the Sky or Green options. Zoom Lens Effect on Brightness.. The standard lens curtails light by 23% at the full telephoto setting, delivering 4,876 ANSI lumens with Normal power and Dynamic color mode. Brightness Uniformity. At 91% brightness uniformity with the lens at its full wide angle setting, any variation in brightness is all but impossible to see. At the telephoto end, uniformity is a still high 84%. Input Lag. Depending on the color mode, the input lag is a quick 16.5 to 17.9 ms, making the WUX7000Z an excellent choice for flight simulators or other applications where real-time reaction is critical. Throw Distance. The WUX7000Z's six interchangeable lenses give it a notably wide range of throw distances, including options for distant or tight placement. For a 200" diagonal, 16:10 aspect ratio image, the four zoom lenses allow a range of 14.2 to 97.8 feet, with the two fixed lenses adding throw distances of 7.7 and 11.3 feet. For the RS-SL01ST standard 1.5x zoom lens we tested with, the range is 21.1 to 31.8 feet. The Canon REALiS WUX7000Z Projection Calculator will give you the throw distance range for each available lens at the image size you want. Mounting and Lens Shift. You can mount the WUX7000Z in any orientation over 360 degrees in any axis. Advanced setup features include built-in edge blending, which lets you create large, multi-projector displays, and a choice of Normal or Expanded range for lens shift. However, Canon says that using the Expanded range can degrade image quality in the corners with some lenses, particularly when taking advantage of Expanded positions in both horizontal and vertical directions. Canon's lens shift specs are the same for all four zoom lenses, and just a touch less than we measured with the standard lens. With the projector sitting on a table, the spec for vertical shift is 55% of the image height up from the centered position and 15% down. For horizontal shift it is 10% left and right of the centered position. With Expanded mode, the vertical shift is +/- 90%, and the horizontal shift is +/-30%. With the fixed 0.54:1 RS-SL06UW ultra short throw lens, an unusual option, the Normal range vertical shift increases to +75%/-15%, and the horizontal shift increases to +/-30%. This lens also offers peripheral focus, which lets you focus the outside of the image separately from the center area for curved surfaces like domes or spheres. 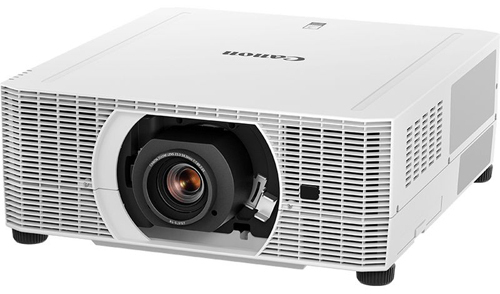 It's hard to imagine any application for a 7,000-lumen, 1920x1200 projector in which the Canon REALiS WUX7000Z would not perform well, making it a more-than-solid value at $8,549. The WUX7000Z is easily bright enough for boardrooms and small auditoriums in higher education, business, and houses of worship. It delivers everything you need for digital signage, for command and control centers, for displays and exhibits in museums and galleries, and more. For situations that require multiple projectors, it offers built-in edge blending, and for real-time simulations where quick reaction time is a primary concern, as it is with flight simulators, it delivers an imperceptible lag of just 16.5 ms.
For any of these applications--as well as others like sports bars--it offers a high res, bright image with vibrant color for graphics and a close color-match to a reference image for photos, film, and video. It also offers a DICOM Sim mode for enhanced presentation of medical images. For ease of setup, the choice of six lenses--including the RS-SL06UW ultra short throw--combines with the projector's H+V lens shift range to offer tremendous flexibility for positioning the WUX7000Z, while the motorized zoom, shift, and focus plus lens memory let you easily adjust image size and position for material in different aspect ratios to maintain constant image height. Beyond that, advanced features like built-in edge blending, 360 degree orientation, and peripheral focus add still more flexibility for creative installations of digital signage, displays, and simulation and training applications. 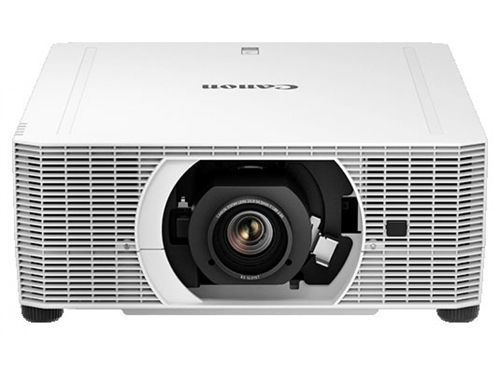 Not only are many of these features impressive by themselves, they work together to make the Canon REALiS WUX7000Z Pro AV Large Venue Laser Projector even more than the sum of its parts. That's easily enough to earn the WUX7000Z our Road Test Certified award as well as make it a sterling value.